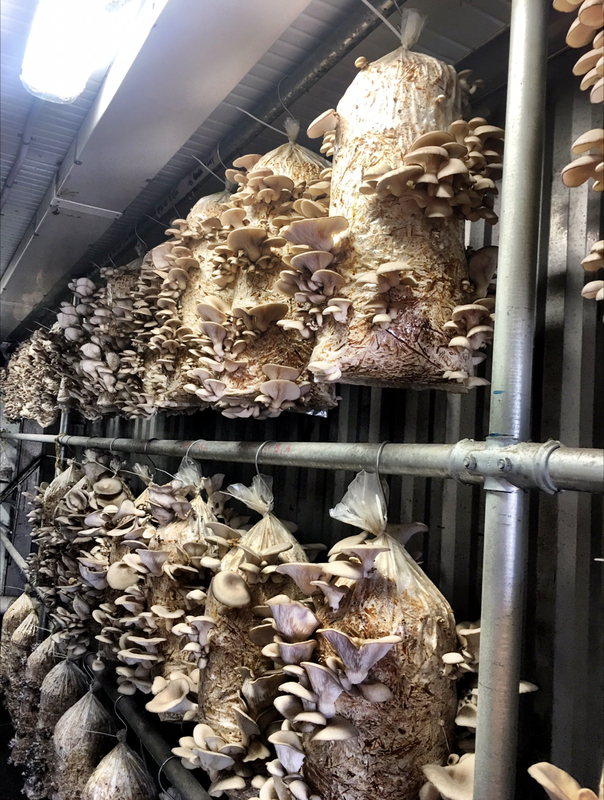 Late July we were contacted by Julian from LifeCykel who asked if we would like to visit their mushroom farm. We booked in a date and in mid August, got the chance to visit LifeCykel’s little operation out in South Fremantle. Once we arrived we were escorted around the property and shown into three different sea containers. The first sea container we viewed through a clear sliding door as this one is pumped with low levels of CO2 mimicking that of the bottom of a rainforest. 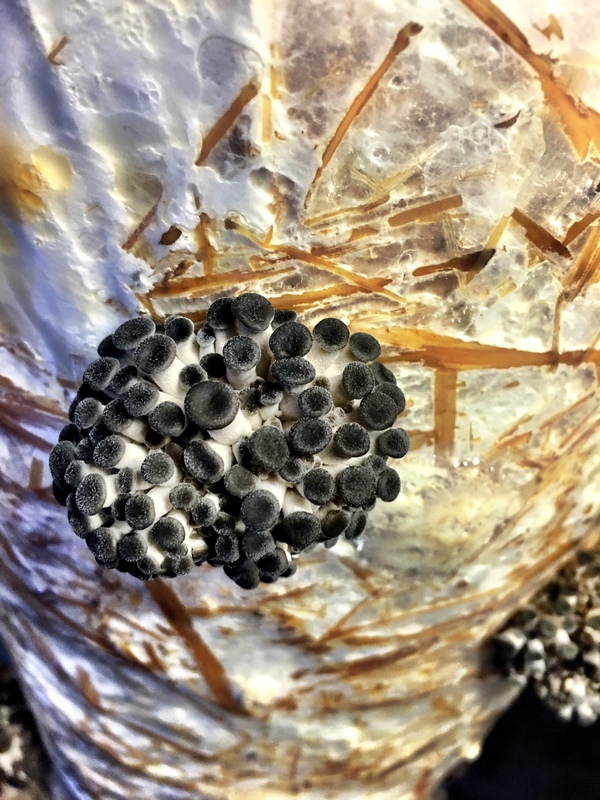 Along some racking installed throughout were some large long bags full of hay and little holes punctured in just the right spots to be maximum mushrooms. Normally these are filled with coffee grinds from all the cafes around Fremantle (Nic and Kolo, Balthazar, Vans, Flour Factory, May St Larder and Don Tapa) but due to the colder weather during winter hay seems to be the better choice. The second container had a humidifier and this real pungent mushroom smell. All the bags in this container had just started to shoot and seeing them just start to form the little clusters and in the third was the next sequence and had the larger mushrooms some ready to be picked and the others only a few days away. I was lucky enough to receive a big bag full and a home grow kit. 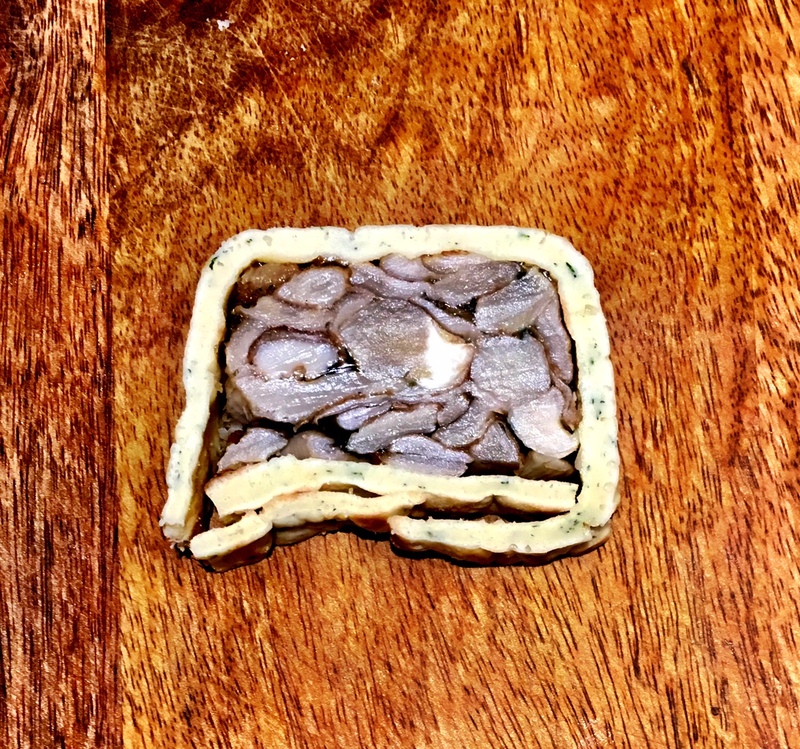 The next day I set off on making a Mushroom Terrine which I had been given as an idea by a good friend of mine. This recipe is featured below, I make small terrines so double the recipe to make a standard sized one. 1. 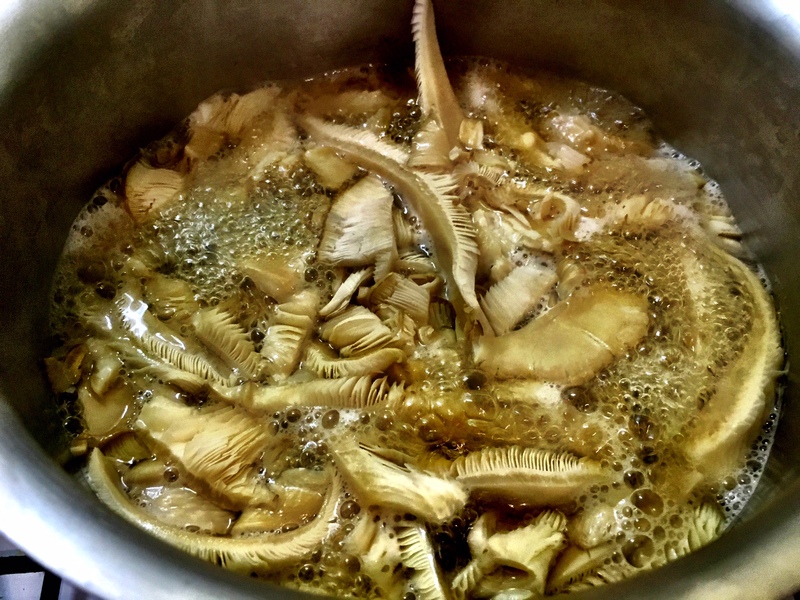 Bring the stock to a boil in a large saucepan, add a generous amount of salt and the dried mushrooms for 15 minutes remove from the pan and discard. 2. Cook the LifeCykel oyster mushrooms in batches for 3 minutes at a time in the stock then transfer the mushrooms to a colander and let them drain. 3. 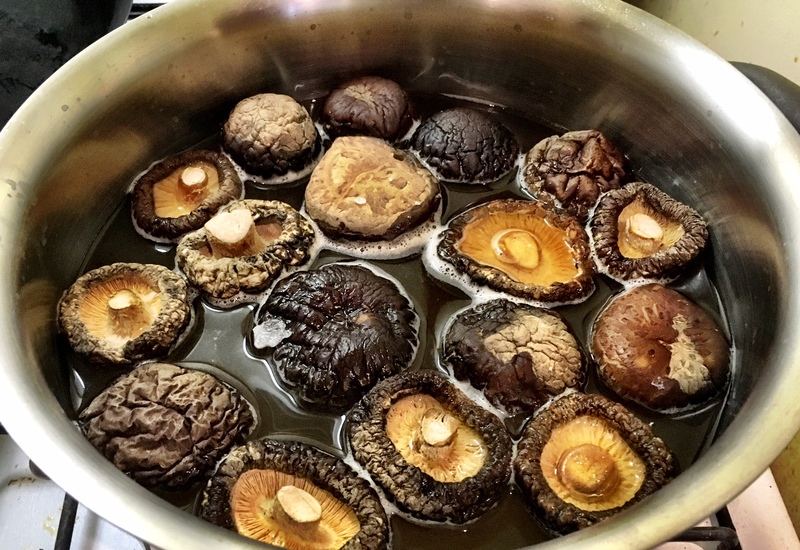 When all the mushrooms are cooked and removed, bring the stock to a boil and reduce by one-third. Allow the stock to cool. 4. 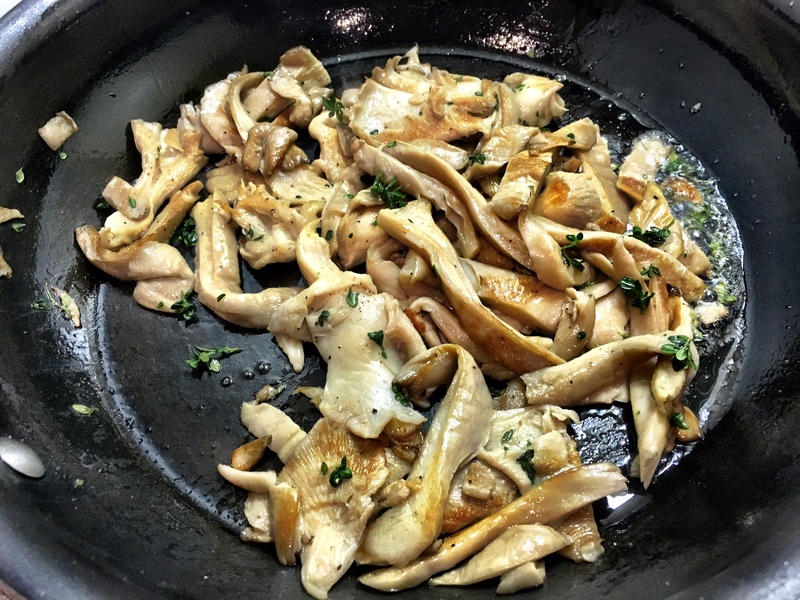 Melt the butter in a large frypan and Sauté the mushrooms with the thyme and leave to cool completely. 5. To clarify the reduced stock, put the egg whites and vegetables into a bowl and whisk. Tip in the cold stock. Bring it to a boil, making sure you are stirring continuously with a whisk. 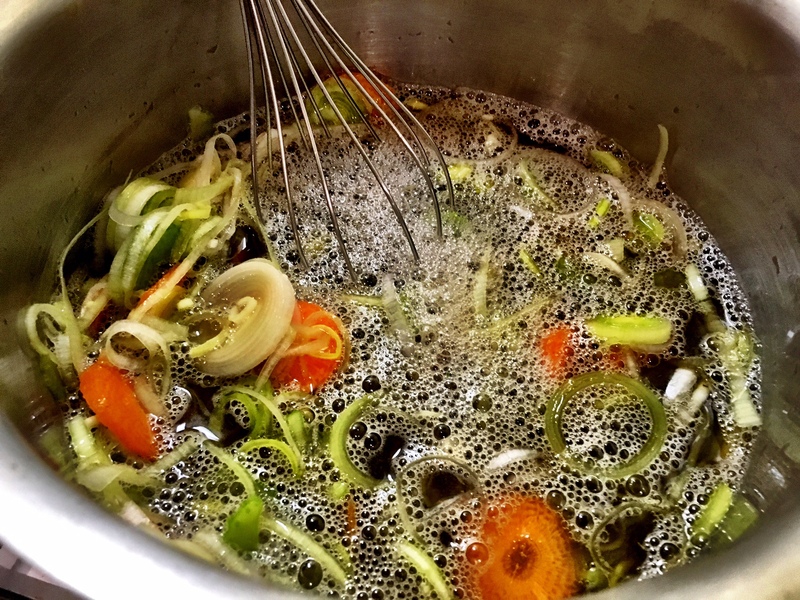 Once at a boil, turn the heat to very low and simmer gently for 30 minutes. Strain the stock through a fine sieve or cheesecloth lined sieve into a bowl and measure the quantity. 6. Allow 14g of unflavored powdered gelatine per 2 cups of stock. Sprinkle powdered gelatin over ¼ cup cold stock (or water) to soften. Add this to the stock, stirring with a spoon until completely dissolved. Leave until cold, and then adjust the seasoning. 7. 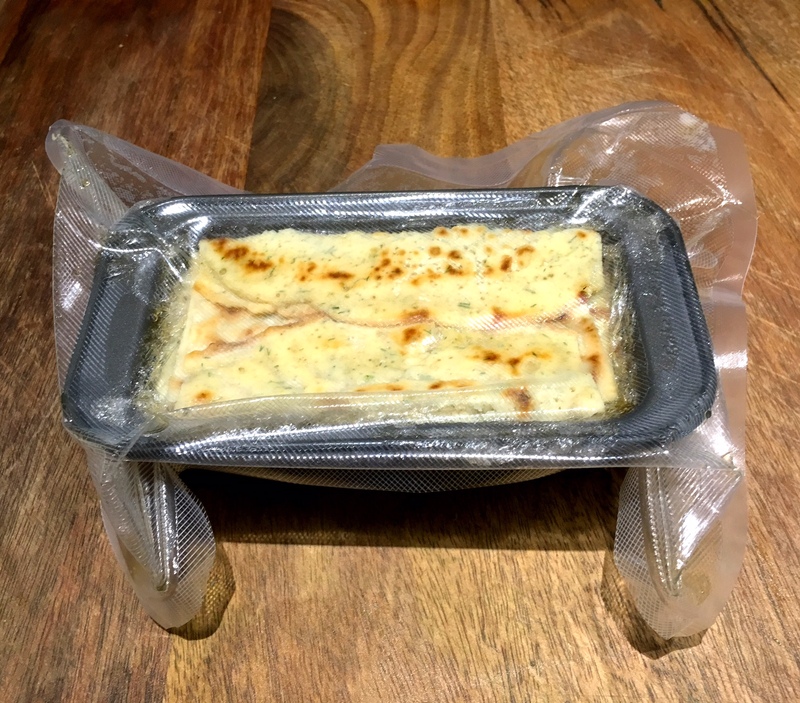 Prep your terrine mold by lining it with plastic wrap and let it overhang the top edges. Next trim the crêpes so that they fit nicely inside your terrine mould. leaving plenty of overhang at both ends and the sides leaving plenty of overhang at both ends and the sides to fold over. 8. 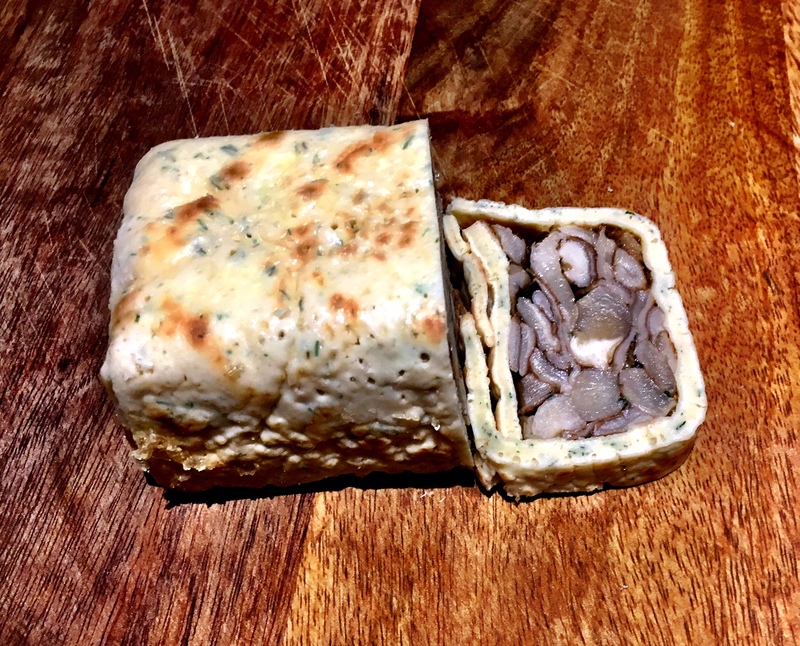 To assemble the terrine, you want to do this in layers. Place one third of each the mushrooms and the stock at a time until the mould is full. Fold the small sides of the crêpes first followed by the larger sides and place into a vacpack bag. 9. Vacuum the bag at full strength and place into the fridge to set. How long to leave in the fridge is completely up to you, the longer you leave it the better it will taste however I would not leave it more than five days. 10. To serve, unmold onto a chopping board and peel off the plastic wrap. 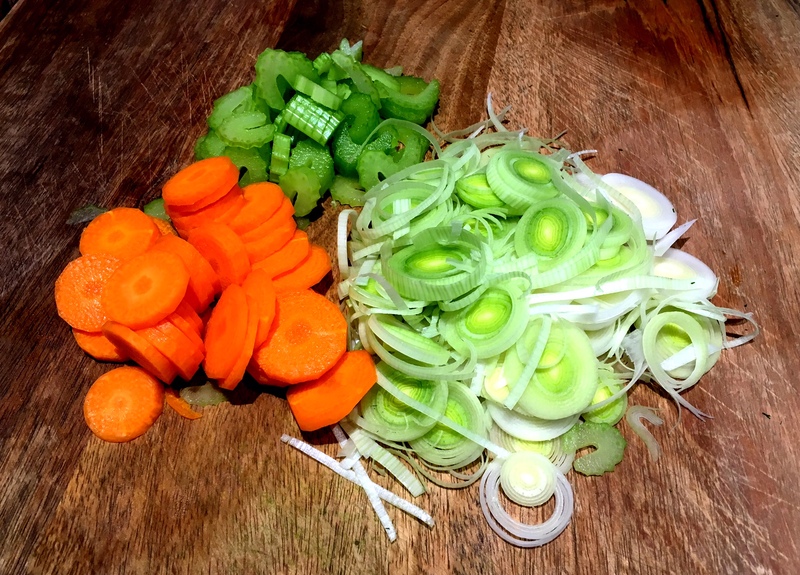 Using your sharpest knife, cut the terrine into slices about 2cm thick. Lay a slice on each plate, arrange with some micro-greens on one side and enjoy! 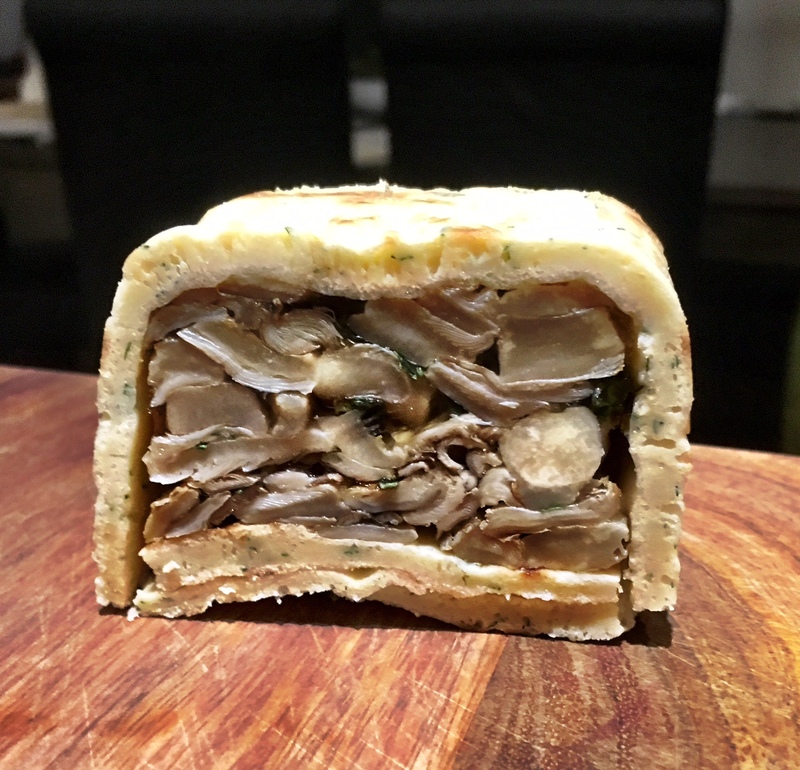 This Post was posted in All Recipes, Sour, Vegetarian and tagged Dill Crêpes, Liefmans Goudenband, LifeCykle, LifeCykle Mushroom Terrine, LifeCykle Terrine, Mane Liquor, Mane Liquor recommendations, Mushroom, Mushroom Terrine, Oyster Mushroom, Shiitake Mushrooms, Stock. Bookmark the permalink.